LinkExchange SearchMe WhatWeDo AboutUs Sitemap Next page Agriculture on Japan's, second biggest island, Hokkaido. 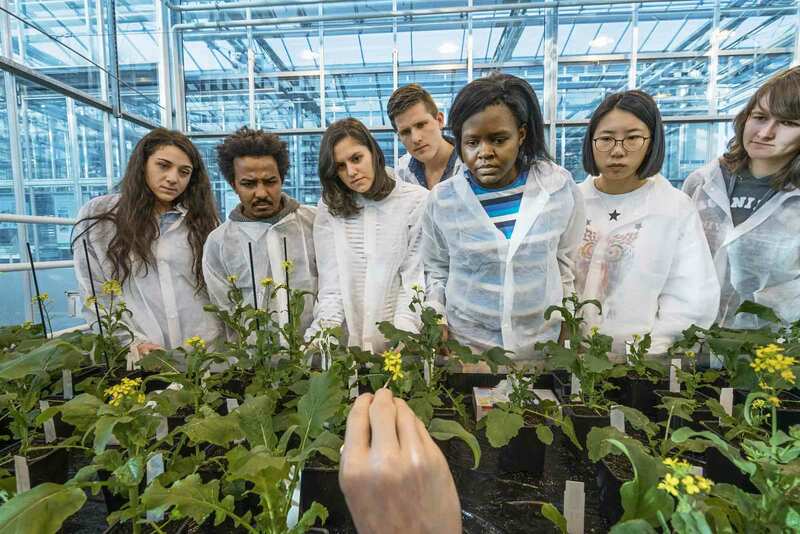 Wageningen University & Research, nestled in Food Valley - the Dutch agro-tech version of Silicon Valley - is key to the Netherlands' agricultural success. The university is also exporting their innovative approach around the globe. FOR SOME DUTCH RESEARCHERS, concern for people threatened by hunger stems in part from a national trauma: The Netherlands was the last Western country to suffer a serious famine, when 10,000 to 20,000 people died in German-occupied lands during the final year of World War II. Decades later, WUR's Rudy Rabbinge, professor emeritus of sustainable development and food security, took up the cause when he helped devise extensive changes in the faculty, student body, and curriculum that transformed the institution into what he calls "a university for the world, and not simply for the Dutch." Today a hefty share of the academic and research activities at WUR are focused on problems facing poor nations. Some 45 percent of its graduate students-including nearly two-thirds of all Ph.D. candidates - are recruited abroad, representing more than a hundred nations. Asians, led by Chinese and Indonesians, outnumber almost all non-Dutch Europeans combined. WUR alumni are found in the highest echelons of agricultural ministries across Africa, Asia, and Latin America. In a campus cafeteria, I sit down with three of WUR's most promising students, a description that, not long ago, would have meant male and Dutch born. All three are young women, hailing from Uganda, Nepal, and Indonesia. "I met a Wageningen alumna when I was undergrad in Uganda," Leah Nandudu tells me when I ask how she wound up here. "She was an expert on phenotyping," the advanced studies that paint a detailed portrait of a plant's traits and potential. "It inspired me to discover that an African could do these things. She was the future: she was where we need to go." The meeting eventually led Nandudu to a WUR scholarship. Her father farms three acres, split between coffee and bananas. Her mother teaches English in a primary school and helps in the field. "We have all the problems farmers face everywhere today, only much worse, especially due to the consequences of climate change." "It's a political problem," she says. New cultivation methods can't be implemented because of a shortage of public funding. "It's also a population problem, the fragmentation of the land into smaller and smaller parcels, suitable only for the use of inefficient human labor and generating very little income." Renna Eliana Warjoto is from Bandung, the third largest city in Indonesia. "People are mistrustful of ideas that come from abroad," she says, as Shrestha and Nandudu nod in agreement. "Farmers are so used to having marginal lives and incomes," she adds, "that they have a hard time believing things could be different." In 1944-45 a lethal famine struck the island of Java, where Bandung is located, killing some 2.4 million people. Devastating regional crop failures have haunted Indonesia as recently as 2005. Food supplies periodically run out in rural Nepal because of drought and high prices on essential imports. In 2011 a famine in the Horn of Africa affected 13 million people, and in 2017 1.6 million Ugandans face starvation without rapid assistance from abroad. All these events were unimaginable at the time, yet they pale in comparison to what could lie ahead. The number of people menaced by famine in just three African nations and across the Red Sea in Yemen exceeds 20 million today and is rising inexorably, according to the United Nations. "We are facing the largest humanitarian crisis since the creation of the UN," the organization's emergency relief coordinator, Stephen O'Brien, warned in March. "Our most difficult task is changing the perceptions of our own people-about the crisis we confront and what we must do to address it," Nandudu says. "That's my job when I go home. We cannot turn our faces away from reality." Next up: Agriculture on Japan's, second biggest island, Hokkaido.